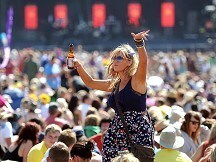 The promoter of the Isle Of Wight Festival has described the event as the "biggest and best" so far. The event is celebrating its 10th anniversary since it re-incarnated the legendary festivals of the late 1960s. John Giddings, the festival promoter, said: "This is the biggest and best so far - it is incredible that it is our 10th anniversary. "As long as the artists and groups want to keep coming we will carry on." Kate Moss is one of the 75,000 revellers to converge on the site at Seaclose Park, Newport, as she holds her hen-do during the weekend ahead of her marriage to Jamie Hince, the frontman of The Kills. The Kings of Leon compared their career to that of spoof band Spinal Tap as they prepared to take to the stage to headline the first night of the festival. And Matthew and Jared Followill said they were "pumped" to be staying in the Premier Inn next to the festival site in Newport. In an interview with Absolute Radio DJ Geoff Lloyd, they said: "(Our band is) Very similar to Spinal Tap. Just, you know, the fighting and the fever blisters, stuff like that. I think it's different now, we don't really argue too much. Yeah, it's gotten a lot better." The festival headliners are Kings of Leon, Foo Fighters, Kasabian and Pulp with other acts including Liam Gallagher's new outfit Beady Eye, Kaiser Chiefs and Tom Jones.